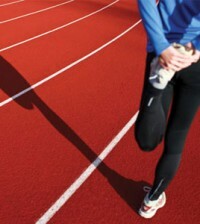 Are you a runner tired of pounding the pavements? Or an active person just looking for a fresh challenge? Well, why not try the 14 mile Coastal Run, one of the only races where you can choose your own route. The Coastal Run is a race of approximately 14 miles, spanning some of Britain’s most scenic coastline. The route heads directly south along an area of outstanding natural beauty in Northumberland between the villages of Beadnell and Alnmouth. The race differs from other long-distance runs in that there are very few sections on road. The route is predominantly on the beach and on cliff paths, which offers a very varied and rugged terrain. While the premise of the race remains the same, over the years an optimum route has been established, so the bulk of competitors follow the same route, though some do still choose alternatives. This year, the race was held on July 12th and had 1200 competitors, the largest number ever. 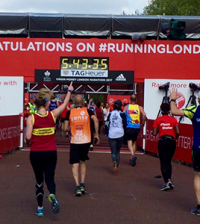 The winning time was 1:17:50 ran by David Kirkland of Alnwick Harriers and the first female over the line, in a time of 1:34:21 was Debbie Appleton of Havering Maybrook AC in Essex. Debbie, who finished second last year said she found the race “very hard with the strong headwind.” She said that the scenery and the terrain of the race made the long journey up from Essex worthwhile, and she is not alone in her love of the race. The Coastal Run was voted by Runners World magazine as the best in Britain for 2007, beating off competition from heavyweights like the London marathon and the Great North Run. The Coastal Run gained this accolade for its organisation, value for money and, above all, for its scenery, scenery which is truly breathtaking. 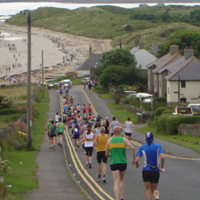 The race starts on the beach, at the tip of the wide expanse of Beadnell Bay, and you begin by running the length of this bay, a popular spot for watersports enthusiasts. Over the coming 14 miles the route takes you southwards down the coast, along the stunning beach at Embleton, which is punctuated at its southerly tip by the dramatic ruins of Dunstanburgh castle. From there, you follow the rocky coastline over undulating cliff paths, past pretty coves and through the quaint fishing village of Craster, before dropping back down onto a wide sandy beach and the finish line by the charming village of Alnmouth. Some clubs bring competitors and supporters each year by coach for the weekend, to not only face the challenge of the run but to enjoy the ambience of being at the seaside. Make no mistake though, whilst the setting may be pleasant, the race is no walk in the park. The terrain is gruelling. Whilst the race is always planned to be at low-tide, to allow running on the harder sand, there are still points when you have to run on the soft sand, which is hard on the legs. The cliff paths are prone to muddiness in places if the weather has been wet in the days before and whilst there are no hills to speak on the route, the paths are undulating with the odd short, steep climb. There are also points at which the most direct route will take you through shallow streams which run into the sea, so you can choose to run through them and get you feet wet or opt to run around but increase the distance. The course record is an impressive 1h:10m:30 sec, set by I Ellis in 1993 and the course record for females was set by T Calder in 1h:22m:42 sec. Race entries for 2010 will open in January next year. To enter, or for more information on the Coastal Run, visit www.alnwickharriers.co.uk.